One of my longtime fans on the Sinister Design forums recently asked me to write a tutorial entry talking not just about how to create a Telepath Tactics campaign, but how to create one that’s challenging, interesting, and fun. What follows is a long (but necessarily incomplete) discussion about some key things you can do to design a really good Telepath Tactics campaign. We’re going to talk about (1) designing good battles, (2) designing satisfying character advancement, (3) structuring and pacing your campaign, and (4) writing an emotionally compelling, memorable story. Battles are the meat of any sRPG campaign, so let’s start by talking about how to design them well. There are a lot of different aspects I could talk about here, but I’m going to focus on two Big Things that you should be thinking about at all times when you’re designing a battle: interesting choices and pacing. When I say “interesting choices,” I mean tough decisions facing the player at any given point; choices between different, mutually exclusive options, each with benefits and risks. If the choice is obvious, it isn’t interesting; each choice should mean risking something. These little dilemmas are the quanta–the minimum constituent units–that comprise a good turn-based fight. • Do I move in tight formation to protect my squishies, even though this exposes me to AOE attacks and getting flanked by ranged enemies? • Do I split up my team to deal with enemies attacking from three directions, or do I keep everyone together and try to block off some approaches? • Do I send off my fastest units to open treasure chests behind enemy lines, thus possibly exposing them to danger while leaving me with less units to carry out the main objectives? Or do I leave treasure chests alone until I’ve dealt with the main threats, thus risking their contents getting stolen by an NPC thief? • Do I keep out of movement/attack range of potentially dangerous enemies while I get everyone in position (possibly allowing them to get reinforcements), or do I rush to the most important targets ASAP and try to protect my vanguard? • Do I move slowly and methodically through the map, destroying all enemy forces for extra gold / experience / item drops at the risk of taking more damage and losing resources, or do I send a flier to beeline for the main objective to avoid getting outmatched? • Do I save that suicidal NPC and expose my own units to danger, or do I let them die and possibly miss out on a new party member or even a side mission? • Do I partially destroy a bridge to create a chokepoint and take the risk of the bridge getting completely destroyed by enemy Crossbowmen as a follow-up? I could talk about this subject for a very long time, but I’ll keep it brief: give the player multiple (meaningfully different) routes through the map; vary the terrain so that there are places on the map that are harder or easier to defend than others (e.g. create choke points, add environmental hazards like traps, pits, or bodies of water/lava); vary the unit composition of groups of enemies; and make sure that the player has at least 1 or 2 optional objectives in any given fight (e.g. opening treasure chests, recruiting NPCs, defending a character or structure). Reinforcements are also a very useful way to force interesting choices on the player, although you must make sure to warn the player in advance if reinforcements are coming–via dialogue, by placing a road visibly leading onto the map from outside, or (preferably) both. Now, pacing–you’ll need to consider this too if you want a satisfying battle! Put simply, pacing is the rate at which the player faces challenges and interesting choices. Ideally, the player should face enemies and/or tactical dilemmas at a rate that is neither overwhelming nor trivial to manage. Assuming you’ve given the player an army similar in size to what I used in the main campaign, I find that making the player deal with 5-7 aggressive enemies at a time is generally a pretty good space to be in, challenge-wise. If there are a lot of choke points or the player has more characters available to use, then you can increase that number; and of course, you can throttle it up or down as you like based on how difficult you want the fight to be. In Telepath Tactics, I manage the flow of enemies via their positioning and–oftentimes–via the use of Passive tags and scripting. 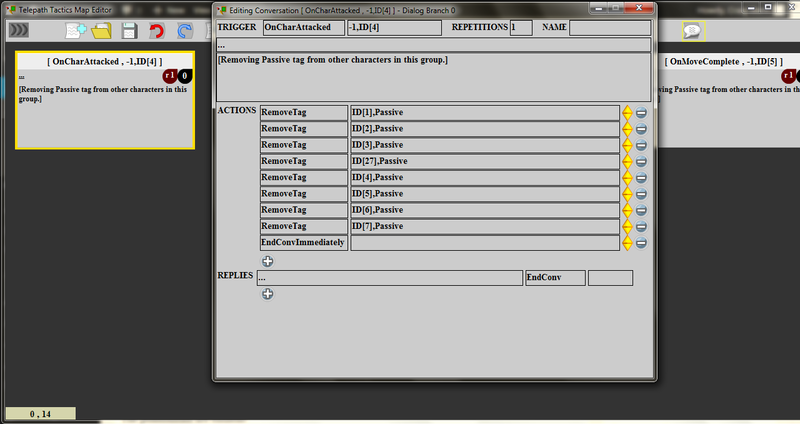 You can see an example of Passive tags and scripting on the right: I set up OnTurn and OnCharAttacked triggers to run scripts that remove the Passive tag from the same groups of enemies, such that the enemies will react as a group when one of them is attacked, or will attack as a group of their own accord if the player is playing too passively. Even if the player is not actively engaging with any enemies, you can still count yourself as doing your job if the player is regularly faced with tactical dilemmas that produce tension. For instance: a battlefield covered with scattered Passive enemies can be very tense to navigate if it’s enshrouded with a fog of war. Still, try to avoid having more than two consecutive turns go by where absolutely nothing is happening–if this occurs, it may mean that your map is too big for the number of units it contains, and that it should be condensed. If your map is reasonably sized for the number of units it contains and the battle still seems too slow, it may just be that you’ve set things up so the player has no reason to press forward into enemy positions. Try adding time-sensitive objectives: a turn limit for beating the map, a chest at risk of being looted by a thief, an endangered NPC, impending reinforcements, limited turns before the enemy figures out that the player is there and attacks en masse, and so on. Make it so the player faces a tangible cost for sitting there and turtling! Alternatively, you can simply make the enemy more aggressive, proactively throwing groups of units at the player. There’s a lot of trial and error involved in all of this. My advice is to quickly block out your level with default tiles, place some objects, place the player’s spawn points and some enemies–and then, before doing anything else, open up Telepath Tactics and test, test, test to make sure that it’s fun to play. If there’s a boring lull or the enemies come too thick and too fast, or if you find that you’re not faced with interesting choices each turn, go back to the map editor and tweak: change the number, placement, and/or composition of enemies; change the terrain; add environmental hazards; add objectives; add tags and scripts to change enemy behavior. Then save your map, return to the game, surrender the battle, and test it again. Interesting choices and pacing aren’t just key to Telepath Tactics battles–they’re important to making a good battle in any sRPG. The wealth of mechanics in Telepath Tactics just happens to make the “interesting choice” part easier to set up than in most other games of this sort. There’s more I could say on the the topic of designing good battles, but we’ve covered the most important parts. Let’s move on and discuss other topics that are key to designing a good campaign. Telepath Tactics is an RPG, and in line with our definition, shaping and developing persistent characters is key to the experience. Consequently, it’s important to do a good job of it. There are two things I’d like to discuss on the topic: reward pacing and advancing characters relative to their battlefield roles. Just as with a battle, correctly pacing character advancement is key to making a campaign engaging. The pace of character advancement will have a fundamental impact on how motivated your players are to carry on with the campaign, so it’s important to get this right. If you’ve ever taken a creative writing class (or a journalism class…any sort of writing class, really), you’ve been told to start your piece off with a hook–something that grabs the reader’s attention and immediately makes them want to continue reading. We want to design our character advancement in the same way. At the start of a campaign, the player isn’t going to be all that invested yet, so we need to get them invested. One way to do this is with a tight reward loop: we want to reward the player for defeating enemies and gaining levels. The player’s characters should gain their first 2-3 levels quickly, and gain a useful new ability every level when they do. Two battles in, their characters should already be palpably better than when they started. The player will feel a sense of swift progress, and will start to feel invested in the improvements they’ve made to their characters. This will encourage players to stick with the campaign going forward as the challenge and complexity level increases. Pacing isn’t the only concern with character advancement: you also need to think about how each character will advance. Properly lining up a sequence of abilities and equipment for later acquisition means knowing what role each character is going to play, then giving them tools appropriate to that role at times when they will be useful. For example: due to their role, the player’s melee fighters will be right up against the enemy, and thus in positions where they can shove the enemy into water or lava. So you’re going to want to teach those characters Shove at some point. I would advise waiting until they’re at a level where they’re heading into a fight with environmental hazards. That way, the player will learn it in time to experiment and see how it’s actually useful. While it’s important to give characters abilities that suit their role on the battlefield, you can also line up abilities to help defray a character’s weaknesses and increase their versatility. The Bronze Golem is a good example: golems are incredible tanks in defensive situations, but they’re also terribly slow-moving, which can make them hard to use in many fights. For this reason, I had Lord Dakarai learn Steam Engine, which lets him pump energy into upping his movement for the turn. His role is still primarily that of a tank, but giving him this ability vastly expands the number of different battles in which he can usefully participate. Note that character advancement isn’t limited to level-up abilities: you can grant access to better equipment and award special items like Lord Dakarai’s “golem parts.” If you can make a special item significant to developing the character’s personality (as with Meridian’s art supplies), then that’s even better. Reward loops aren’t the only kind of loops we must be concerned with when designing a campaign; we want to be concerned with our core loop as well. Notice that our core loop here is not Battle-Battle-Battle-Battle-Cut Scene-Battle… Fights in Telepath Tactics are intense and mentally exhausting; it’s important to give the player some breathing room in between battles so they can relax a bit. For this reason, I would advise against directly stringing together more than two battles in a row within the campaign. In the main campaign, I primarily used cut scenes to break up the sequence of fights–this is commonplace for strategy RPGs. Rather than relying on the player to find NPCs in order to advance the plot and develop characters, sRPGs tend to advance their story elements more or less automatically. Following this sRPG structure was a design decision on my part to keep the campaign moving briskly forward; but you might choose to throw in more wandering and exploration instead. Whatever you do, the key thing is to make sure you space out your plot and character development beats appropriately. You do not ever want to dump a single, gigantic, 200-line cut scene onto the player. If you do that, their eyes are going to glaze over midway through and they’re going to just skip over everything. First cut scene: hooks the player with the mystery of Sarn Kamina and the two little girls she’s just deposited in the snow; establishes the relationship between Sarn Kamina and Ambuur Sang. Training battle: establishes the relationship between Emma and Silithis while simultaneously teaching the player the basic controls. Second cut scene: develops the relationship between Emma and Sabrina; establishes their character motivations as well as the specific goal underpinning the entire plot. Zash and Red battle: establishes that Emma and Sabrina are traveling to the nearby village of Adelbrae; introduces the player to Bloodbeard’s Bandits; name-drops Igor and Fera for the first time; teaches the player how to control multiple characters in battle. Third cut scene: introduces Gavrielle and Farasat; establishes their relationships to one another and to Emma. Introduces Louise and Madeleine; establishes their relationships to one another and to Sabrina. Further develops Emma and Sabrina’s personalities. Adelbrae battle: introduces Gunther Lathe; establishes Bloodbeard’s Bandits as an antagonist faction connected to the main plot of the campaign; teaches the player how to manage a group of characters with varying battlefield roles. As you can see, I managed to pack in quite a lot of information into the game’s opening scenes. (Among other things, I introduce the player to a whopping 15 unique characters!) I didn’t just dump it all on the player at once, though. I spaced it out between–and within–battles, and all of it is delivered in the form of natural-sounding conversations between characters. This way, I can transmit loads of information without completely overwhelming the player. Keep in mind that I also worked pretty hard to keep the dialogue that establishes all of these things short and pithy, making the most of each dialogue branch. Even the biggest of those opening cut scenes–the third one, where we introduce four important new characters at once, establish their personalities, establish their relationships to one another, and form brand-new relationships to the protagonists–weighs in at only 77 lines! If you can’t write scenes quite that succinctly, then the solution is easy: just space things out some more. You’ll give yourself more space to work with if you avoid wasting scenes. The more scenes you have that don’t serve any purpose to plot or character development, the more information you’re building up that you’ll have to dump on the player later. It’s better to work it in at each step so you don’t get that information backlog. If a battle serves no purpose to further the plot or develop your characters, then ideally, you should either reimagine it so that it does have some plot significance, or else take it out of the campaign in favor of a scene that does. So we’ve talked about how to design good battles, how to design satisfying character advancement, and how to structure and pace the overall campaign. The final thing that I’d like to talk about here is story. Story-writing is a big, big topic–whole books have been written on how to do it well. Today, there are just two things I want to impress on you about writing a good RPG story: use character arcs, and write a character-driven plot. Let’s look at some examples of good character arcs. Perhaps the most dramatic character arc I can think of in an RPG protagonist occurs in Cecil, the hero of Final Fantasy IV. When you start the game, he is a dark knight of Baron, the captain of an airship squadron. He is tasked with attacking the city of Mysidia and forcibly taking away its sacred treasure. He does as he is told, but he later questions his orders and is stripped of his rank. Still, despite his reservations, Cecil continues to obey his king. Gradually, as he is faced with the mounting consequences of his dutiful obedience, he starts to disobey–and eventually, he rebels entirely. Cecil’s transformation culminates in a journey to a cave where he must metaphorically (but also literally, because it’s an RPG) reject his old self in order to be reborn a paladin. You want to include character arcs in your story because they are emotionally significant–and that, in turn, makes them memorable. I haven’t played Final Fantasy IV since I was a teenager, and I would have a hell of a time telling you all the locations that Cecil visited, who he fought, who was in his party at the time, or why–but I can definitely still recount Cecil’s growth and transformation from the dark knight who committed atrocities as a pawn of his king into a righteous paladin devoted to undoing the damage he caused. In RPG stories, it’s the growth of the characters that counts; as a player, that’s the part that sticks with you. There are many ways to construct a character arc–one relatively straightforward and effective way to build a character arc is to give your protagonist a major character defect that they come to recognize and address. Silithis has a character arc like this. Another way to do it is to give a character a personality defect that they may not recognize, but which they overcome when the situation requires it of them. Sabrina, in overcoming her complacency and fear and coming to unconditionally support Emma in her moment of crisis, has an arc of this sort. You could go the Greek tragedy route, and give one of your protagonists a tragic flaw, a sort of mental blind spot that they don’t change, leading to their demise. (This would be the “fall arc” mentioned here.) We almost never see this one trotted out in RPGs, though it does get some use with one of the main cast members in Telepath RPG: Servants of God. Character arcs don’t have to revolve around a personality flaw; they can be of the simpler “hero’s journey” sort. Emma grows from a frustrated girl running away from home into the level-headed and inspiring leader of a small army. That counts, too. The bottom line is, give your main characters arcs. Even if none of the arcs are earth-shaking on their own, they can lead to some emotionally rich and memorable scenes, and they can get players invested in your characters in a way that the reward loop alone cannot. Now, about making your plot character-driven: this means nothing more than having the plot proceed from the desires and motivations of your characters. I wrote a bit about character-driven plotting in the “NPCs and Plot” section of this article back in 2011. At the time, I had non-linear wRPGs in mind, but the importance of letting character drive your plot remains potent in a linear sRPG campaign as well. By its very nature, making your plot character-driven will force the plot to make sense. After all, plot is what the characters do; if what the characters do is driven by what the characters want and believe, that’s invariably going to result in a more coherent story than if it does not. And that, in turn, will make the plot easier to remember. Why did Cecil visit the moon in FFIV? Hell if I know. But we all know why Emma goes to the mines. That’s the power of a character-driven plot. There is a lot more that goes into making a good campaign than I’ve managed to cover here, but I feel like this hits the highlights. To sum up: (1) design battles packed with interesting choices, delivered at a regular but manageable pace; (2) design the advancement of the player’s characters appropriately; (3) evenly pace your campaign and your story; and (4) employ character arcs, and let the motivations of your characters drive the plot. Think I’ve missed anything? Feel free to comment down below! This entry was posted on Tuesday, October 6th, 2015 at 6:55 AM and is filed under Developer Rants, Fan Stuff. This post is tagged design principles, Telepath Tactics, tutorials, video game writing. You can follow any responses to this entry through the RSS 2.0 feed. leave a response or trackback from your own site.